"At Heritage, I learned to be passionate and take chances," Logan Gay says. "I wouldn't be the person I am today without it." Gay, a 2011 graduate, now works as a news reporter for Lakeland Public Television, a Minnesota affiliate of PBS. The network's goals are to "educate, enrich, entertain, and enlighten"—and Gay fulfills them daily by preparing and covering stories for the six and ten o'clock news. "I wish I could say that I have always wanted to be a journalist and a reporter," Gay says, "but that isn't the case." Instead, she searched for a career that combined her love of reading and communication, originally deciding on print journalism. But her freshman year at Ashland University, Gay was invited to help operate a camera for a school television broadcast—and everything changed. "When I saw the hustle and bustle and the anchors sitting in the bright lights, I knew I had to be a part of it," Gay says. "I love putting on a show every day." Gay began to take advantage of everything Ashland had to offer in way of broadcasting, including anchoring opportunities freshman year—a chance not offered to underclassmen at most universities. By her senior year, Gay created her own program with the help of her friends: an entertainment show called Applause. "It was an awesome experience," she says. "My only regret is that I wish I could have had more time with the show." 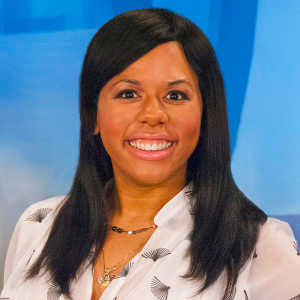 Gay's university experience segued first into an internship at Ohio station WMFD-TV and then into her current position at Lakeland News. Now, she functions as a general assignment reporter, working both behind and in front of the camera. "Every day I learn something new," Gay says. "Every day I am given the opportunity to be better than I was the day before. Lakeland News is the perfect place to start my career." Gay credits both her Heritage experience and her faith to her current success. She says that Heritage not only taught her to value education, but also how to integrate her faith into her daily life. "My faith has impacted my life and my career in so many different ways," she says. "I know that I would not have these opportunities if it was not for the grace of God." With daily Bible readings and prioritized prayers, Gay has come to rely on God in everything—especially her career. She plans to go as far as possible in her field, using her platform to give back to the community and uplift the young people in it. "As I look back on my journey, I can seriously see God ordering my steps and positioning me where I need to be," Logan Gay says. "Because of what God has done for me and continues to do for me, I know without a doubt I am destined for greatness. I have already claimed it."